Situated on a farm in a lovely area of rural Argyll with just a short walk to the shores of Loch Awe. Barn is a comfortable peaceful holiday cottage for 2 people, suitable for couples or friends with flexible zip-linked double or single bed options. A well-designed living area and kitchen upstairs with a birds eye view of a squirrel feeder. Argyll with its lochs, hills and mountains to climb is one of the most scenic areas of Scotland and Barn is a good base for exploring Oban, Inveraray, Glencoe, Loch Lomond, mid-Argyll where you’ll find Crinan Canal and historic Kilmartin Glen, and the beautiful peninsula of Kintyre. Closer to home, hire a boat for a day on loch Awe or enjoy a walk up the nearby forest track or the ruined settlements on the farm. Barn is semi-detached with Stable which sleeps 4 and both are graded 4 star by the Scottish Tourist Board. The upstairs floor is open-plan with plenty light and views of the hills, and you can see the loch from the windows. The kitchen, dining and living areas are comfortable and easy to live in. Downstairs you’ll find the bedroom with flexible bed which can be made as either a large zip-linked double bed or separated to make 2 single beds plus a large walk-in wardrobe. The shower room and wc are next door. The entrance porch has plenty space for storing boots and shoes, and hanging coats. Outside a picnic table in a walled garden area is just for guest staying in Barn and there is a bench on the hill nearby for sitting, relaxing and enjoying the views over Loch Awe to the hills and mountains beyond. Loch Awe is 25 miles long and the longest loch in Scotland. Surrounded by forests, farms, hills and mighty Ben Cruachan. Explore the nature and islands on Loch Awe on a boat from Loch Awe Boats, just 7 miles from Barn. Fishing for trout and pike is by permit and these are available at the farm or from Loch Awe Boats when hiring a boat. Red squirrels and Pine Marten come to the feeder by Barn, though the Pine Marten are generally night visitors. Red Deer come into the fields in the evening especially during the colder months and they often take a short cut by Barn when returning to the hill in the morning. When travelling home in the evening you will probably see some small Roe Deer by the roadside. During the spring and summer Loch Awe is also home to many Osprey which swoop down to take fish from the loch. Eagles, dolphins and porpoises are best seen by joining an organized tour. I was brought up on the Farm, but went away for school and then worked in Ireland and Poland for a few years before happily returning to the farm by lovely Loch Awe with her husband Martin. Catriona now looks after the self-catering holiday cottages and looks forward to welcoming you to Blarghour. This cottage is part of an old converted barn on the farm which is on a quiet country road in a peaceful setting with beautiful scenery by the shores of Loch Awe. This an upside down house, so you enjoy a good view of the night sky, the deer if they walk by and the squirrels at the feeder. If you open the windows or go for a walk in the morning and evening the bird song is amazing, sunsets can be spectacular and the wildlife is all around if you slow down to look and listen. Barn is cosy with central heating radiators. Barn has it's own washing machine. There is a clothes line and tumble dryer nearby Barn which guests can use at anytime. Fridge/freezer, hob, grill and oven, microwave, kettle, toaster and washing machine, pots, pans, crockery, glasses etc. Washing may be dried in a nearby tumble dryer or on the washing line by Barn. There is a selection of books which guests have left and also bird books and books on local history. Please note that Barn is situated 10 miles along a quiet country lane. Gas & Electricity These are metered and charged 'at cost', as an extra, at the end of your stay. We feel that this is fairer than an 'all-in rental' figure as there can be a big variation in usage week to week. The Barn is a well presented and comfortable cottage for two. Friendly welcome and helpful information given by owners. Very peaceful and unspoilt area with lots of potential for Photos and Nature watching. Great boat hire from Loch Awe Boats a real must if you are staying close by. We enjoyed our stay at 'The Barn' the property is lovely and clean and warm, plenty of hot water, and a comfortable bed. We enjoyed seeing the sheep population increase while we were there, some lovely walks around and about. Catriona made us feel very welcome. We were able to visit Oban, Fort William, The falls of Dochart, and not forgetting the Kilmartin museum which we found very interesting. Wonderful time, really quiet, warm, comfy and cozy in beautiful surroundings. Lovely walks and views in the middle of nowhere. Highly recommend. I enjoyed visiting the ruined castles round the Loch, and the walks round the area were quiet and had some spectacular views. I would love to come back and explore further. The property was clean and well maintained and I found it with no problems. We would fully recommend a stay here. The Barn has everything you need, is very clean & comfortable, a perfect place to stay & discover the area, with lovely walks & views that are stunning. We won't hesitate to book again next time we visit Scotland. 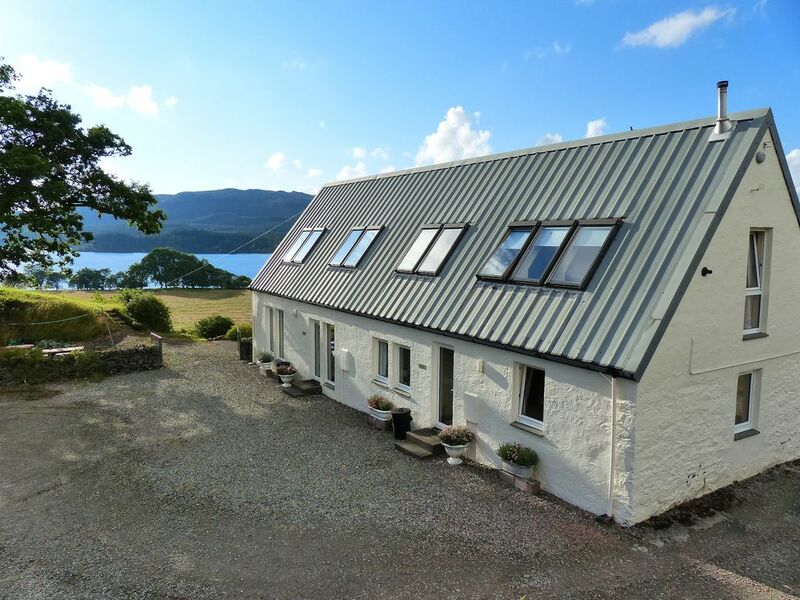 Barn is in a a stunning rural location close to Loch Awe, but please note that it is 10 miles along a country lane and the nearest shop is 20 miles away at Inveraray. Groceries can ordered for delivery direct to Barn via Tesco supermarket online.